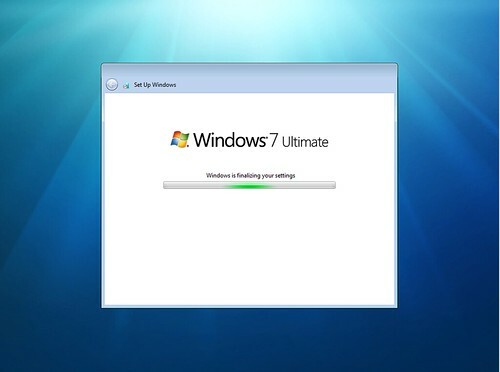 This is going to be the last part (at least for now) for this step-by-step guide for customizing and deploying Windows 7 images with MDT 2010. On the previous posts we’ve learned how to run the firsts configurations on MDT, adding operating system files and creating a task sequence for the reference image (Part I); and also adding Office 2007 to the reference image and making it a silent installation (Part II). The third post it’s going to be just to deploy the reference and customized image, and then capture it into a .wim file, that we can later deploy using MDT or add it to Windows Deployment Services (WDS). Since we already have our boot environments, ISO and WIM files; and that we have the Windows Deployment Services role installed, I’ll start using it: I’m going to add the LTI boot image to WDS that will let me create and capture the reference image. Note: You can also use the ISO file too boot from a CD or, if it’s a virtual machine, mounting it; but using WDS keep the things a lot easier. 1. 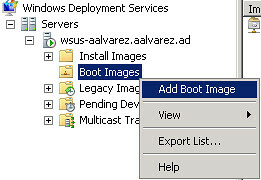 Open WDS snap-in > “Boot Images” > “Add Boot Image”. 2. Browse the MDT distribution share, inside the “Boot” folder. And select “LiteTouchePE_x64.wim”. Click “Open”. 3. Finish up the boot image wizard. 4. Now on the computer you are going to use as the reference, boot from the network to receive WDS boot image. And select the LiteTouchePE image you added. Note: For proper WDS configuration with DHCP and boot images, check this post. 5. Once the boot files are loaded, a new wizard will be prompted. Select your “Keyboard Layout” and click on “Next”. 6. 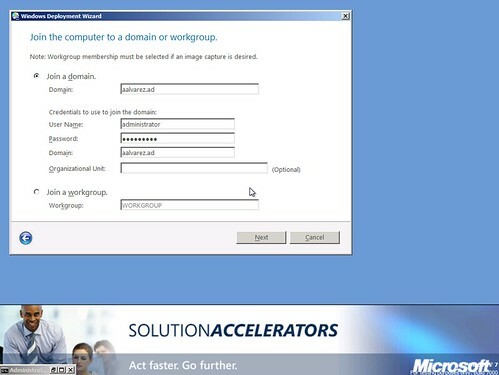 Insert the domain credentials that will be used to access the shared files used by MDT 2010. Use a domain admin account to avoid any inconvenient. 7. Select the task sequence to be executed: “Deploy Windows 7”. 8. Enter a computer name. A random one is created by default. 9. Leave the option “Join a Workgroup”. IMPORTANT: Do not add it to a domain, otherwise you won’t be able to capture the image you are about to deploy. A machine joined to a domain it’s not a good idea to be captured, because if the sysprep task is removed from the deployment, you will have several issues about the Security Identifiers (SID) within the domain. 10. Since we are not migrating any image, this is a fresh deployment select “Do not restore user data and settings”. 11. Select your location and keyboard layout to be configured on the reference image. 12. Select the “Time Zone”. 13. Select the application you are going to install “Microsoft Office 2007”. 14. You can skip BitLocker configuration if you want to and set “Do not Enable BitLocker for this computer”. 15. Leave selected the option “Capture an image of this reference computer”. And insert the filename “WIN/_REFERENCE.wim”. Click on Next. 16. Here you’ll find a summary of the options selected. Click on “Begin” and the installation process will start. Notice that this tasks could take several minutes, depending on your hardware. Try to not interrupt the process. After all this, the WIM file is created and stored in “%distribution%\Captures”. – Add it to WDS and start deploying it from there. But you don’t get a chance to make any other changes to that image, unless you create a new one. 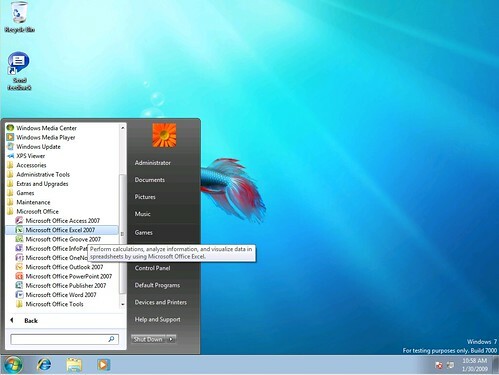 – Add it to MDT 2010 as a new customized OS. You can add or modify new task sequences to this new machine, for example, adding a new application or enable/disable other features that will be included directly in the deployment. We are going to take option 2 for now, since the WDS option does not require any other task other than “Add Install Image” from the console. 1. “Deployment Workbench” > “Distribution Share” > “Operating Systems” > “New”. 2. Select “Custom image file” and click on “Next”. 3. Browse for the WIM file that was created and click on “Next”. 4. Leave selected “Setup and Sysprep files are not needed”. 5. Select the directory name: “WIN7_REFERENCE”. And click on “Finish”. Once you click Finish a process starts working checking the integrity of the file and several other tasks, it could take several minutes to complete. Be patient and the image should appear as a valid operating system. Now that we have the image of the OS, we are going to create the task sequence that will be using that image. 1. “Deployment Workbench” > “Task Sequences” > “New”. 2. Insert “Task Sequence ID”: “Win7_Target”. 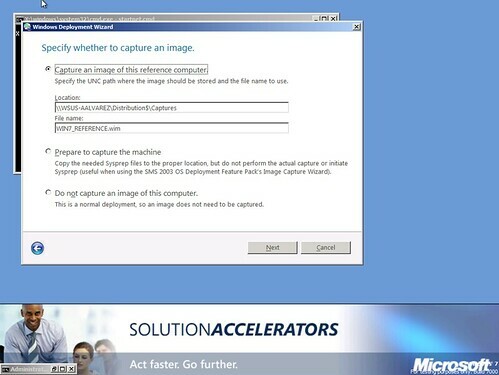 And name “Deploy Captured Image – Windows 7”. 3. Select “Standard Client Task Name”. Click on “Next”. 4. Select the reference OS just added from the list. 5. Leave selected “Do not specify product key at this time”. 6. Complete the OS settings like it was done before. 7. Specify Administrator’s password and click on “Finish”. We’ve now configured everything that was needed for this reference image, so we can start deploying it to a client. The process will be the same that we used for creating the reference image, the only twist regarding the previous configuration is that we are going to join to the domain this machine. 1. Boot from the network on the client machine. 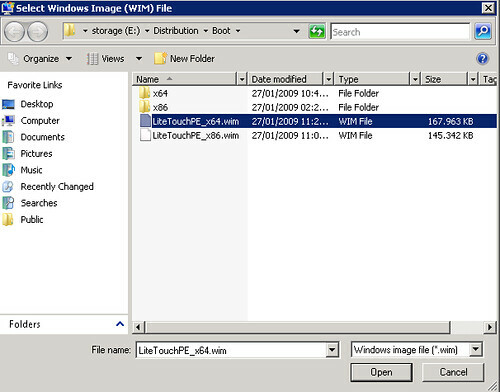 Select again “Lite Touch Windows PE (x64)”. 2. The wizard will prompt again. Select your “Keyboard Layout”. 3. 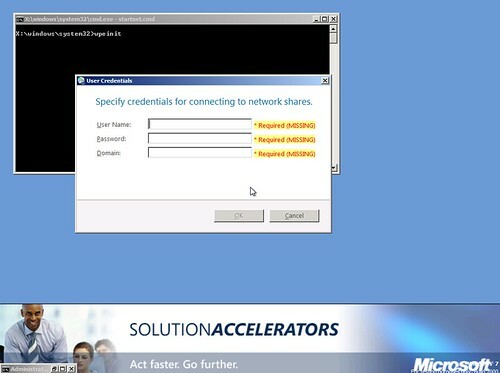 Specify domain credentials to access the network shares. 4. 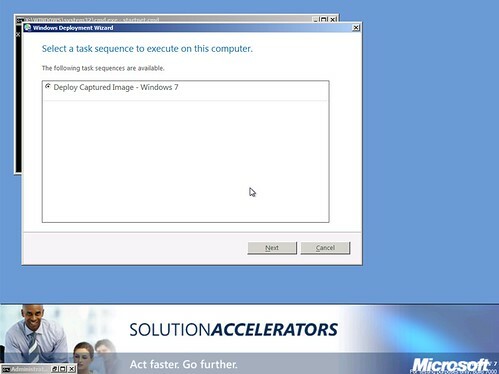 Now we are going to select the task sequence created to deploy the customized image “Deploy Captured Image – Windows 7”. 5. Select the computer name. 6. Join the machine to the domain. 7. On the summary section click on “Begin” to start. Notice that the option to capture the image was not present because we selected that we are going to add this machine to the domain. Once it’s done, you’ll see this message. Check “Details” for more information. Office 2007 installed with all the components. If you are not familiarized with this deployment tool, it’s a great chance to start with MDT 2010. Automated deployment tools will give you a lot of profit and flexibility once you get the chance to get to know, manage and maintain them. For more info about it, check my other Windows Deployment Services posts. Even though this is just a MDT Beta version, did not bring me any stability problems. We expect to get to know more about the functionalities once it gets to a RC version or RTM. Check the MDT help included in the installation, you’ll find almost everything you need to know there (most of the sections are the same as in MDT 2008). 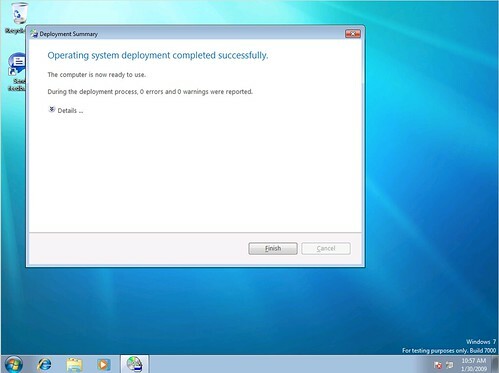 Well that’s pretty much it for now about Microsoft Deployment Toolkit 2010 Beta 1 and Windows 7. I hope that you find these posts helpful. I have worked with MDT 2008 before, now when i am trying to deploy windows 7 in my mdt 2010 lab i can´t get my win 7 to join the domain. I have made changes to unattend.xml to join domain with the correct package. I can se in the logs that it reads the settings and insert them to unattend.xml on the system. But it never joins the domain and no errors are found in the deoploymentlogs?? Can you give me a hint on what the problem is? That is a bit strange. You are using LTI for deployment right? Can you paste the unattend.xml section related to the domain joining? 2. I had to include setupfiles with my created image to be able to deploy it, in your gide it says that you´r not supposed to? 3. The name of the deployed computer is still “Master” even if i enter the name “Client1” in the guide before deploying the image. Before we can check on the files configuration, can you tell me the big picture of the process you are executing? It is the same that I used on these posts? I have to make sure that we are on the same page, because I never had to use sysprep manually to prepare the image. I got the same problem as the previous poster Olav – can’t join the domain. I’ll wait for the WAIK RC, they may have fixed that by then. Of more concern to me is the Product Key and activation. At no time did your great tutorial mention to enter them. Is this because we are dealing with “generic” keys, rather than VLKs? Anyway, I built my system using the Win7 Professional version (rather than ultimate). 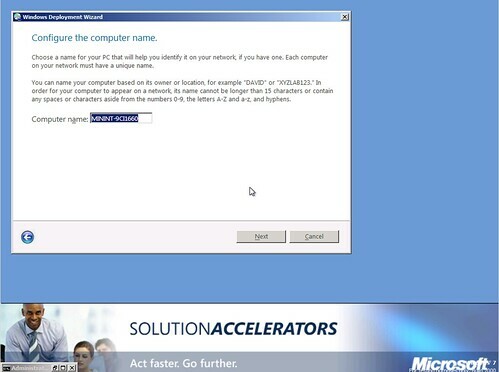 The Activation Wizard now tells me that it can’t activate Win7 using the supplied key. Wtah gives? I was testing my image this morning doing it the same way as you,ie using WDS and specified I wished to do a capture. As it started sysprepping it failed with the following error. I am aware you can munually create the locationserver.xml file and specify to use it but I am basically using all default settings and am baffled why its looking for it. Any ideas or know where i can get help with this?? Which version of MDT are you using? Beta 2? I haven’t test it yet this version, but I can comment a little bit about locationserver.xml. The location about this file must be X:\deploy\control (as mentioned by the error you said), so I’m not sure if that’s the actual problem. I was able to fix it finally by editing the Z-HAL-Detect script. For some reason the variable of the destination drive was pointing to X: instead of C:, I don’t know why MS would changed that in this version, I had to changed all references to the sysprep.inf and hal.dll file to manually reflect C:\ at the begining of the string instead of a variable & string. 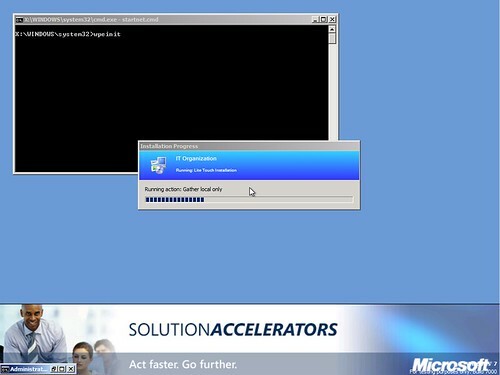 I am trying to deploy a wim image of Windows XP SP3. I was checking the code of the new ZTIGather.wsf and comparing to the old one I noticed that is a lot different. That error code 8000 was not included in the old ZTIGather. I am using the same HAL detect script I was using in MDT 2008. Would this be a bug of this Beta release? Any help would be appreciate it. Thanks for sharing your workaround. Since I’m not working right now with MDT 2010 Beta 2, I’ll be reviewing those configurations. I’m trying a LTI deployment with MDT 2010 with a custom Win7 .WIM using the steps you’ve listed, but it’s trying to install the OS using SETUP rather than just applying the .WIM. Can you tell me what I’m doing wrong? Are you using the LiteTouch ISO created within the process? or ar you using the WIM file added to WDS? Yep, I’m using the LiteTouch ISO. “Unable to find Sysprep.inf, image deployment may not be automated”. Where is sysprep.inf supposed to be? thanks for any input. I’m having the same error message that DAAZ deploying images using MDT 2010 RTM. Where can I find this file “Z-HAL-Detect script? What should I change in sysprep.inf and hal.dll file manually to reflect C: \? 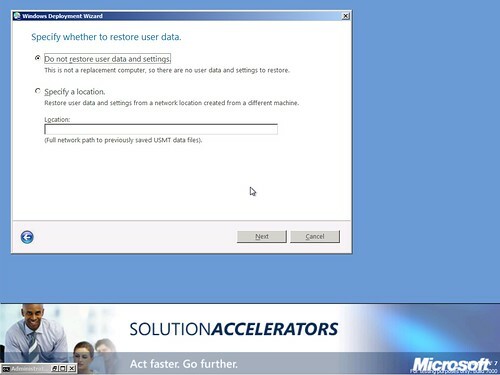 Do you know how to add direct service pack via MDT 2010 RTM? They told me to go through the menu “Applications”, adding a “source files” and declare a command line (Windows6.0-KB936330-X86-wave0.exe / quiet) to start the installation but during this operation my task sequences “stop after installing the service pack and does not create wim image. 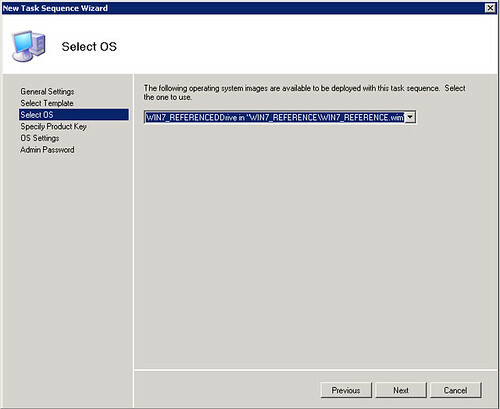 I have successfully used MDT 2010 to deploy the OS using image and source files and installed apps and drivers. Now that the target machine has the OS and the drivers, is it possible to use MDT to deploy just the app and not the entire OS again. And I mean ANY APP not just office. 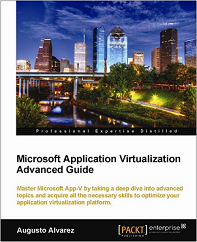 You will need MDT combined with System Center Configuration Manager 2007 to accomplish that. Just wondering if you deploy Windows 7 and then capture it, will the captured image have all the drivers you added in the Out-of-Box Drivers? So if you install the wim file on a different model it will install all the drivers for it. On my experience, sometimes depends on driver involved. Most drivers remains in the process. In case you need separate drivers for different models, you can use the Out-of-Box Drivers section within MDT. Why do you deploy to the reference computer and then capture it for redeployment? Why can’t you just deploy directly to the target computers? It seems like deploying the captured image gives you less flexibility to customize the apps that get installed. That is actually the supported deployment process, since within this process the deployment sets the necessary OS configurations and the applications involved. 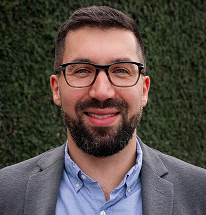 Hi Augusto – fantastic three articles on getting started. I’ve followed them and am trying new things as I move along. I’ve deployed a reference image and am now looking at deploying this image to a PC which has a machine name pre-staged in Active Directory. Not sure how much automation I can put in. DO you have any further articles that are as well written? Thanks for the comments. 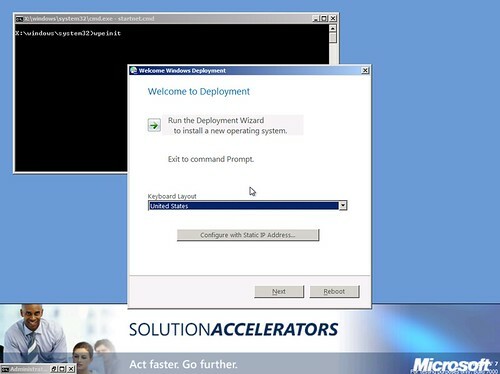 I’m working on a new set of posts, using MDT 2010 RTM plus new automation process. Is there any option to go into audit mode and install applications > sysprep and save the image with MDT? I couldn’t find it. Maybe I can use WDS for capture boot and save the wim and later import it to MDT? I want more applications in the image ready from the beginning. What about default profile in MDT? I am also having a problem joining the domain. We do not want to create a list of MAC addresses. We would prefer that the Tech that is imaging the classroom be prompted for the computer name, enter and then join the domain automaticcally. I am able to join the domain. My problem is that windows 7 creates a random name and joins the domain. Then I get prompted to name the computer. The only other way that I know to do this is to add a script to rename the computer and the join the domain. Is there a way to do this in the answer file without creating a script? I tried adding firefox.exe as my application and attempt to boot to lite touch. Everything went fine just that the application was not installed. There were no errors, you have any idea where i should look at? Well, I seem to be getting a clearer understanding of MDT, WAIK, and WDS. I am however struggling with speed. It’s taking 3 days or to deploy and capture a new image for deployment. I cannot understand where and why there’s such a lag. 3 days to deploy and capture an image is crazy. At the outside, I would expect a couple of hours with a couple of apps. Would you have any insight ? I’m clueless and not certain where to look first. As an fyi, I have wds, mdt, and wail running on a server seperate from DHCP. I am using PXE to boot with LTI boot image from wds. Any help or direction would be appreciated. Thanks. That’s incredibly strange. There’s something wrong with your connectivity. Which is the slower process? Deployment, capture? Uploading the image? Did you have the chance to test the same servers in a reduced environment? at the moment, I’m seeing something about “attempting multicast transfer” during 1) trying to deploy win7 from dvd image, 2) install office 2007, and 3) capturing that image. I’m running step 1 and that’s the 2nd attempt this week on a different machine. I have a gig network. Any operable computer using the same port flies. Now, I did make 1 change on the WDS going from “use addresses from the following range” to “obtain ip address from dhcp”. Rebooted the laptop I’m trying to work with but made no difference. As a matter of fact, step 1 started where it left off. The multicasting could be responsible of the slow transmission, did you try disabling it from the images (including boot files) you are deploying? no i haven’t tried that. Can you guide me into making that change ? I will look at your recommended links. However, I have disabled multi-tasking on WDS and MDT. progress seems to have improved. I’m not going to bet on it yet but it appears to have some improvement. Will you posting new docs about MDT ? I have printed the 3 parts you posted and they’ve have been wonderfully helpful. The following articles will be available soon and with some improvements from the old ones. I have gotten further in the last 20 minutes that I did for 3 solid days and am contributing that slowness to the multi-casting features on wds and mdt. I’m making progress but running into small brick walls along the way. many I’ve been able to overcome but I’m now at a point that is a struggle to pass through. I’ve built an image on a reference computer and have been trying to capture an image. However, after sysprep runs (i think it’s using the “generalize” setting), I lose all network connectivity and can’t proceed. Where can I find the sysprep.exe that’s being used and the sysprep.inf that needs to be alter ? I suspect the “gerenalize” switch needs to be removed. Thanks again. There’s something wrong with your task sequence, did you try regenerating it and point the file to the capture.wim file again? I found another way to capture an image using wds pxe, goto to DOS, and running imagex to capture to a network drive but when attempting to deploy, I’m getting “litetouch deployment failed, return code -2147467259”. This is something about setup files but not sure how, why, or what to do. Any direction ? The image you are trying to capture with imagex must be syspreped in order to be compatible. Check for the SMSTS.log file (it may reside in %TEMP%, %WINDIR%\System32\ccm\logs, or C:\_SMSTaskSequence, or C:\SMSTSLog) and verify there if you are finding any type of misconfiguration. Did i want to modify the any image or WIM captured image ? Great article. 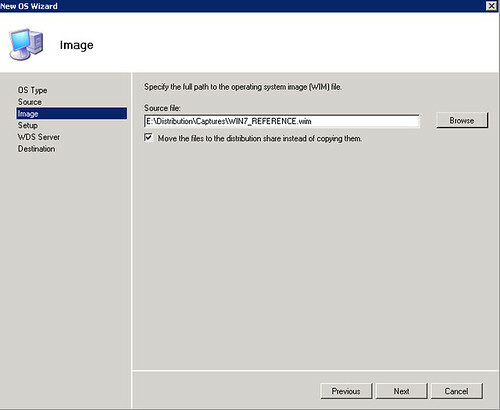 I am trying to deploy a custom image with MDT 2010. Is there a way to create a default user profile on the image, capture it and then deploy it and have all users loging getting the settings of the customized profile? Thank you for your suggestions. The only way to do it smoothly is using USMT combined with MDT 2010, this feature will migrate the existing user profiles while the image is being deployed; once the deployment is complete, the profile is inserted again on this new operating system. There are some other configuration you can achieve by mounting the WIM file into a directory (a modify some files/folder inside the profile directory); or you can do a little bit more using Group Policies. Bom dia Augusto, estou ulizando a ferramenta do mdt 2010 para implemenatar o Windows XP SP3, no caso consigo gerar a midia inicializavel, mais quando renicia aparece a formatação normal do windows xp, tudo automatizado, é possivel pular essa tela no proceso do deployment? You ahve been kind to help me through some challenges with MDT/WDS/WAIK, etc. I’ve run into a new challenge. I have created and a new task sequence to install Win7 on a different Dell desktop model. The task has been created, update the win files, updated deployment, and replaced the boot image with the updated boot image (Lietouch_x64.wim). I start the desktop to put an image on using PXE. Am prompted to select a boot image and do. The “Accelerator Solutions” screen pops up but nothing more. It doesn’t move forward for operating system choices, etc. I’ve worked to document everything I’ve done but may have overlooked documenting this. I believe either the Task Sequence was edited or the unattend.xml was edited but can’t recall exactly what small change was made. Do you have any clues ? 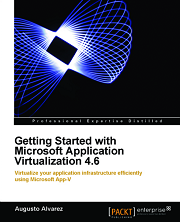 There is an updated version ( 1.1 ) of the Graphical Quickstart Guide to the Microsoft Deployment Toolkit 2010 available now on http://www.justcode.ca that contains minor updates to the mapdrive sections. I have a challenge request and need your help. The target computer has C and D drives, just want to deploy reference image to C drive after formatting C drive, D drive can’t have any change including data and size. How to configure a task in MDT2010? Does anyone know how to deploy language packs using MDT 2010? Try adding them into “Packages” within the Deployment Share. First your blog is alaways very hepfull and clear. You have already met this problem ? Take note that language packs (for Operating Systems and Office 2010) depends on the architecture used. If you are using Windows 7 64bit, the OS language pack must be 64bit; if you are using Office 2010 32bit you must use 32bit language pack.